Although Aruba is a relatively small island, its history go back many hundreds of years. 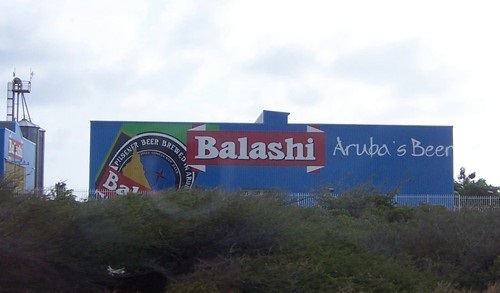 Aruba sightseeing tours are a definite must when visiting the island. The island offers tourist a vast list of sights and interesting places to visit during their vacation. For residents of the island there will always be something new to visit and spend endless days taking in all that Aruba has to offer. Aruba Realty has created an ongoing list of special sights to see to give you an idea of what our little island has to offer. If you have been to any special places on the island, we would love to hear about them. Simply write to us at info@coldwellbanker.aw and tell us, we will be happy to add it to our growing list of sights to see on Aruba. 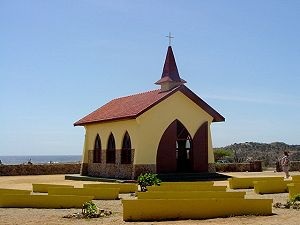 This beautiful little chapel sits all alone near to the islands northwest corner, inside you will hear the wind as it whistles through the mustard colored walls, unusual boulders and towering cacti. The Chapel of Alto Vista means highest view and it is one of Aruba's most cherished landmarks, the road leading to the chapel is lined with little crosses, each one marking the stations of the cross with verses from the bible. The locals view this as a very special place and often visit the chapel to enjoy the peace and to light a candle in the chapel. The aloe vera plant was first introduced to Aruba in 1840 and the first plants were planted on 150 acres of land at Hato Plantation. 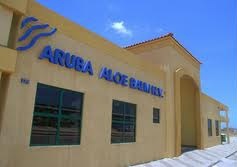 The Hato Plantation is the location of the museum and factory that produces Aruba Aloe products today. The Caribbean sun and the desert environment of Aruba help to increase the plants natural healing qualities and helps to produce the worlds most powerful aloe gel to heal and revitalize skin. When you visit the factory and museum you will learn all about the making of the products from seed to production line, and you will also be able to learn about the fascinating history of the plant on the island. If you want to see how the excellent local beer is made, take a trip to the Brewery, tours are offered daily to the public showing all stages of the beer making process. The tour lasts for an hour and the price includes a free drink at the end. If you are looking for a fun evening out with the emphasis on drinking the beer, there is a happy hour at the brewery every Friday from 6pm � 9pm with live music. A visit to this beautiful tropical garden will provide an unforgettable encounter with nature in all its beauty, butterflies from all over the world will be fluttering above you head while you take this magical tour. The tour gives an insight into these beautiful creatures from egg to caterpillar to chrysalis to butterfly and if you arrive early you may be lucky enough to witness new butterflies emerging from their chrysalis and taking their first flight. 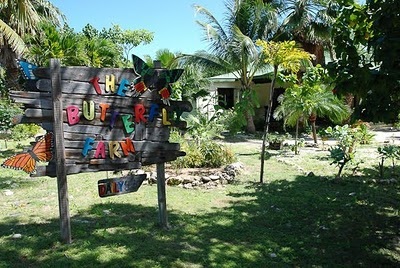 Your admission ticket will give you free entry to the farm for the rest of your vacation. The presence of these unusual rock formations are truly a mystery as they do not match any part of the islands geological formations. The extraordinary boulders that rise up from the desert soil to create an unusual setting have walking trails and steps through the boulders so that visitors can explore in closer detail. 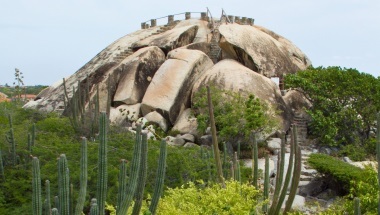 Visitors can climb to the top of the rocks to get a wonderful view of the countryside, don't be surprised if you encounter a few Aruba whiptail lizards on the way up!